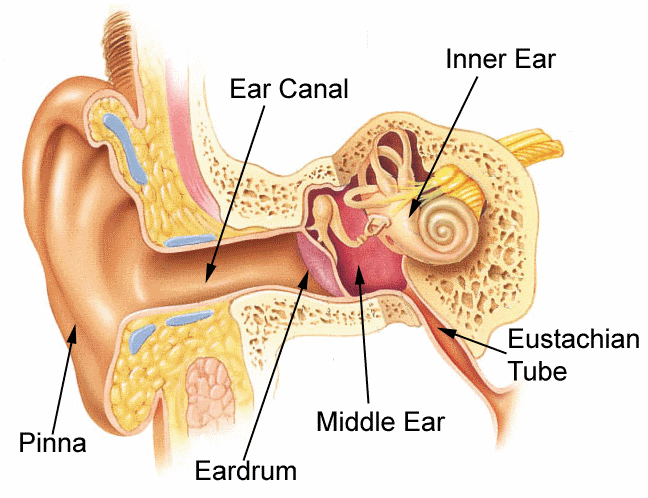 The ear is made of 3 main parts: the outer ear, the middle ear, and the inner ear. The outer ear consists of the part you can see (the Pinna), and the ear canal. The middle ear is made up of the ear drum and the 3 little bones (ossicles) that conduct the sound through to the inner ear. The inner ear is made up of the cochlea and auditory nerve. The cochlear is made up of thousands of tiny hair cells that pick up sound and move to stimulate the auditory nerve which sends the sound to the brain. A loss of hearing is usually the result of damage or abnormality in one of the ear structures. Hearing loss is usually labelled according to the location of the problem in the ear. There are 3 main types of hearing loss: Conductive, Sensorineural, and Mixed hearing loss. In addition, someone may only have a hearing loss in one ear, known as unilateral hearing loss or single sided deafness.